April 6, 2016 – NASA’s Near-Earth Object Wide-field Survey Explorer (NEOWISE) mission has released its second year of survey data. The spacecraft has now characterized a total of 439 NEOs since the mission was re-started in December 2013. Of these, 72 were new discoveries. Near-Earth Objects (NEOs) are comets and asteroids that have been nudged by the gravitational attraction of the giant planets in our solar system into orbits that allow them to enter Earth’s neighborhood. Eight of the objects discovered in the past year have been classified as potentially hazardous asteroids (PHAs), based on their size and how closely their orbits approach Earth. Since beginning its survey in December 2013, NEOWISE has measured more than 19,000 asteroids and comets at infrared wavelengths. More than 5.1 million infrared images of the sky were collected in the last year. A new video, based on the data collected, depicts asteroids and comets observed so far by NEOWISE. Originally called the Wide-field Infrared Survey Explorer (WISE), the spacecraft was launched in December 2009. It was placed in hibernation in 2011 after its primary mission was completed. In September 2013, it was reactivated, renamed NEOWISE and assigned a new mission: to assist NASA’s efforts to identify the population of potentially hazardous near-Earth objects. NEOWISE also is characterizing previously known asteroids and comets to provide information about their sizes and compositions. 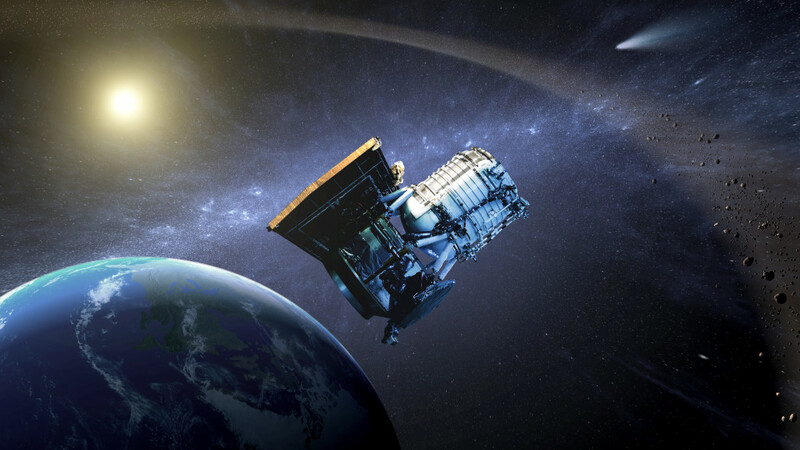 “NEOWISE discovers large, dark, near-Earth objects, complementing our network of ground-based telescopes operating at visible-light wavelengths. On average, these objects are many hundreds of meters across,” said Amy Mainzer of JPL, NEOWISE principal investigator. NEOWISE has discovered 250 new objects since its restart, including 72 near-Earth objects and four new comets.